Futsal, derived from the Portuguese term “Futebol de salão”, translates to “room football”, which is a version of indoor soccer with no walls. The game is played between two teams, each consisting of five players, including one goalkeeper. 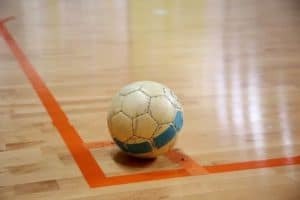 Unlike traditional indoor soccer, Futsal’s boundaries are determined by lines, so the walls are not used. In addition, the game utilizes a smaller ball than regular soccer because of the hard court surface on which Futsal is played. The game is also unique in that it uses hockey sized goals rather than normal soccer goals. The sport is recognized by both the International Federation of Association Football and the Union of European Football Association. The Gatlinburg Futsal Championship will take place at Rocky Top Sports World on January 23 and 24, 2016. The Gatlinburg Futsal Championship includes divisions for boys age groups u7 – u19, girls age groups u7 – u19, and a high school division for high school teams only. The registration deadline for this event is December 31, 2015, and the tournament fee for all ages is $495. Players will not be allowed to wear cleats for the event, so indoor or tennis shoes should be worn to participate. Spectators will enjoy seeing the unique sport of Futsal played in 48 minute games for all ages. Every team will play a minimum of 3 games, so you can look forward to seeing your family and friends compete in at least several games! There is plenty of parking available at Rocky Top Sports World, and a nominal parking fee of $10 will cover your parking for the entire weekend. If your team is traveling to Gatlinburg to participate in the Gatlinburg Futsal Championship, Rocky Top Sports World and T3 Travel are pleased to offer a number of excellent lodging options in the Smoky Mountain area. Simply click the Book Lodging link on our Gatlinburg Futsal Championship events page to review the available hotel properties. Please book using this link to obtain the best group rates possible for this event! Rocky Top Sports World has a convenient meal plan for the players participating in the Gatlinburg Futsal Championship. We believe in healthy eating for the athletes participating in our events and tournaments, so we have several meals that can be pre-ordered online by visiting the Rocky Top Sports World Food Plans page. Rocky Top Sports World has quickly become one of the most talked about tournament destinations in the country! Attend the Gatlinburg Futsal Championship to check out our massive 86,000 square foot indoor complex. In addition to our state-of-the-art facilities, we offer bleacher seating, team rooms, an on-site grill, and much more. Whether coming to the Gatlinburg Futsal Championship, one of our Smoky Mountain soccer tournaments, or one of our other many events, we are sure you will be quite impressed with the facilities at Rocky Top! This entry was posted in Gatlinburg Sports Events on December 5, 2015 by Jason Fishman.